Led by a checklist of all-time greats across several sports, 2012 Upper Deck All-Time Greats Sports Edition packs a ton of punch. Granted, it comes with a steep price tag. But few can complain the solid odds of getting an autograph from the likes of Michael Jordan, Wayne Gretzky, Tiger Woods or LeBron James. Okay, maybe those who get a Pete Rose signature might have wished they opted for something a little less expensive. That said, if it weren't for Rose's perpetual penmanship, few would deny that his on-field accomplishments should exclude him the product. Every 2012 Upper Deck All-Time Greats Sports Edition box comes with an autograph and three additional base or parallel cards. With only 20 players on the main checklist, it's a who's who kind of product. All of the autographed inserts have a high-end feel, like something collectors might find in Exquisite or SPx. Among them are the die-cut All-Time Forces. Taking the idea further are the All-Time Dual Forces that come with two signatures. 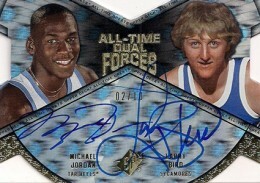 Among the pairing are Michael Jordan and Larry Bird, Jordan and LeBron James, and Wayne Gretzky and Mario Lemieux. The set's subjects are also paired with deceased legends in Legacy Cuts book cards. Another interesting set is Personal Touch, in which signers inscribe answers to questions like their favorite food or music. All autograph cards are extremely rare. All are numbered with none being higher than 45. Most are much less. To get an idea for what's hot in the set, ere's a real-time look at the 50 most-watched 2012 Upper Deck All-Time Greats Sports Edition cards currently listed on eBay.